You don't have to be one of the Chosen People to recognize Aaron Novik's tremendous musical gifts. Bay area-based bass clarinetist Aaron Novik's album Secrets of Secrets is a very difficult thing to discuss. It is an all-encompassing outing; it appeals to the intellectual, bookish side in all of us while simultaneously going after our raw, cathartic emotional side. There's an array of disparate elements thrown into the mix, both from an instrumental and compositional point of view, but it never feels overcooked or cluttered. He incorporates traits of metal, jazz, avant-garde, musical numerology, and Jewish traditions, and thrusts them into the lion's jaws. The ratio of risks taken to those that pay off is high, and one is hard-pressed to explain how or why it all sounds so dangerously grand. Novik's source of inspiration is an old one, dating back to the 12th century. Mystic author and Talmud scholar Rabbi Eleazar Rokeach, aka Eleazar of Worms, watched helplessly as crusaders, on their merry way to Jerusalem, murdered his wife and children. The destitute Eleazar Rokeach turned towards his writings to compromise the presence of a God in such cruel times. These writings became important documents of early Jewish mysticism, sifting through the Torah for signs of divine numerology and spiritual guidance for a crusade-savaged world. And if the film π has taught me anything, it's that the Hebrew alphabet and numerology are closely intertwined. Aaron Novik is out to crack the code, to set the ancient writings and rituals to music and to then update the sound of that music to something that can vie for attention in the 21st century. Novik has assembled a bewildering band to match the demands of this unusual music: Matthias Bossi on batterie, Cornelius Boots on robot bass clarinet, Carla Kihlstedton on electric violin, Willie Winant on percussion, Fred Frith on guitar, Ben Goldberg on clarinet, Lisa Mezzacappa on bass, Aaron Kierbel on drumbek, the Real Vocal String Quartet, and the Jazz Mafia Horns. If you are familiar with just one of those names, then you already know that Novik and company are playing with fire. And this time, when the burning sensation begins, you are thankful. Much like Eleazar Rokeach's quest to unlock spiritual realms, these sounds introduce you to a frighteningly new place, one that reminds you that you can have a painfully sensitive sense of hearing. If you didn't get burned now and then, how would you be aware that you can feel? It may contain only five tracks, but Secrets of Secrets boasts more than an hour of tantric vortices specified to match spiritual ascent. Novik admits that if he were to follow the Kabbalistic texts to the letter, each song would have been approximately 40 minutes in length. Clocking in at more than ten minutes apiece, it's surprising that no track overstays its welcome. Each contains at least one organic metamorphosis inside of it, making sure that the word "boring" never, ever comes to mind. Leadoff "Secrets of Creation (Khoisdl)" has enough sea changes within it to satisfy the whole album. The gently caterwauling strings that being the album, though independently entrancing, are hardly the focal point here. The ensemble gradually builds in volume before Frith and Kihlstedton roll around a six-note figure for almost three minutes (The Black Hole anyone?) before a the whole band comes to a full-stop. A nasty, distorted lead takes center stage before the Jazz Mafia Horns get to shine as a complimentary component to some kind of klezmer jazz metal. "Secrets of the Divine World (Terkish)" gets right to point, parlaying a menacing progression from one key to another. The final three-plus minutes completely obliterate any preconceived notion the climax gave you as everything falls apart in ambient feedbacky noise. "Secrets of the Divine Chariot (Hora)" has one of those pounding vamps underneath Novik's ominous minor-key passage that sounds like it's building up to something – yet it never really does. "Secrets of the Holy Name (Doina)" is the sound of squawking guitars and woodwinds getting lost in a cavern. Album closer "Secrets of Formation (Bulgar)" sounds like mathematics coming to life within music, repeating an ascending patter over and over again while always subtracting the lowest note from the previous go-round. Like I said, it's a difficult thing to discuss. If writing about music is the same as dancing about architecture, then writing about something as personal as spirituality has got to be even more discouraging. Yet the writings of Eleazar Rokeach and other scholars have been around longer than music criticism. Finding that Bermuda triangle where religion, writing, and music perfectly intersect is almost futile. 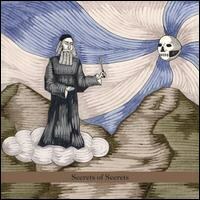 But I will tell you this: There is no album like Aaron Novik's Secrets of Secrets, and if there is any justice, it will go down in musical history as the brazenly spellbinding piece of music that it is.